Sparrow Girl Review: In 1958 China, the Sparrows are declared the enemy. 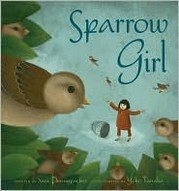 Sparrow Girl review: The Sparrow Girl is a fable, based on a true historical event, that examines the consequences of upsetting the delicate ecological balance of the natural world. 'Sparrows are our enemies,' declared Chairman Mao, the communist ruler of China in the late 1950's. He ordered all citizens to repeatedly bang pots and set off firecrackers to frighten the small birds to death. And the war was a great initial success. The sparrow population in China was almost completely eradicated within three days. But the war on sparrows quickly developed into an appalling ecological disaster. Without the sparrows to eat them, the locust population exploded and devoured most of the crops. The result was a famine of biblical proportions which killed 40 million people. In a century notable for daft human behaviour and disaster, the Great Sparrow War shines as an inimitable beacon of human arrogance and folly. The Sparrow Girl describes the Great Sparrow War through the eyes of a good-hearted young girl, Ming-Li. Ming-Li doesn't blindly follow the orders of Chairman Mao, nor the callow dictates of her brain-washed family and rural community. Instead she courageously searches for and finds seven sparrows and saves them from the villagers. The villagers later rue their terrible mistake in wiping out the sparrow population; the realization dawns that their crops are failing due to pests decimating them. Ming-Li eventually wins the respect and approval of her family and fellow villagers because of her courageous actions in saving the seven sparrows. Sparrow Girl has attractive illustrations that features a limited colour palette. The dominate colours - different shades of greens, browns and blues - reflect the natural hues of the rural environment. Only the main protagonist, Ming-Li wears clothes of strong reds. The Sparrow Girl is recommended for readers aged 9 and upwards.